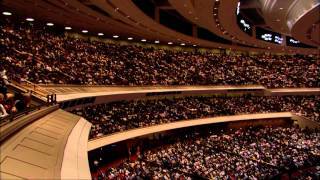 The Tabernacle Choir provided music for the Saturday morning, Sunday morning, and Sunday afternoon sessions. Craig Jessop, Mack Wilberg, and Barlow Bradford directed the choir. John Longhurst, Clay Christiansen, and Bonnie Goodliffe were the organists. A combined choir from Utah County provided music for the Saturday afternoon session. Steven Kapp Perry directed the choir, and Linda Margetts was the organist. Music for the priesthood session was provided by men of the Tabernacle Choir joined by Melchizedek Priesthood holders from the Salt Lake area. Craig Jessop and Barlow Bradford directed the choir, and Richard Elliott was the organist. From the November 2001 Ensign — Music by a combined Relief Society choir from stakes in Sandy and Brighton, Utah, directed by Rebecca Wilberg, with organist Linda Margetts: “Guide Us, O Thou Great Jehovah” (arranged by Wilberg, unpublished; Hymns, no. 83); “From Homes of Saints Glad Songs Arise,” (arranged by Wilberg, unpublished; Hymns, no. 297); “Be Still, My Soul” (arranged by Wilberg, unpublished; Hymns, no. 124); “Lord, I Would Follow Thee” (Hymns, no. 220). From the November 2001 Ensign — Music by the Mormon Tabernacle Choir, directed by Craig Jessop and Mack Wilberg, with organists Clay Christiansen and John Longhurst: “Come, Listen to a Prophet’s Voice” (Hymns, no. 21); “The Lord Is My Light” (arranged by Kasen, published by Jackman; Hymns, no. 89); “Baptism” (Children’s Songbook, 100); “Now Let Us Rejoice” (Hymns, no. 3); “I Saw a Mighty Angel Fly” (arranged by Wilberg, unpublished; Hymns, no. 15); “We Thank Thee, O God, for a Prophet” (arranged by Wilberg, unpublished; Hymns, no. 19). From the November 2001 Ensign — Music by a combined choir from Pleasant Grove and Lindon, Utah, directed by Steven Kapp Perry, with organist Linda Margetts: “Home Can Be a Heaven on Earth” (Hymns, no. 298); “I Am a Child of God” (unpublished; Hymns, no. 301); “Come, Ye Children of the Lord” (Hymns, no. 58); “Testimony” (arranged by Dalton, published by Plum; Hymns, no. 137). From the November 2001 Ensign — Music by the Mormon Tabernacle Choir with selected Melchizedek Priesthood holders, directed by Craig Jessop and Barlow Bradford, with organist Richard Elliott: “Come, Rejoice” (arranged by Bradford, unpublished; Hymns, no. 9); There Is a Green Hill Far Away” (arranged by Bradford, unpublished; Hymns, no. 194); “Come, O Thou King of Kings” (Hymns, no. 59); “Lord, I Would Follow Thee” (arranged by Dayley, published by Jackman; Hymns, no. 220). From the November 2001 Ensign — Music by the Mormon Tabernacle Choir, directed by Craig Jessop, with organist Clay Christiansen: “The Morning Breaks” (Hymns, no. 51); “Cast Thy Burden upon the Lord” (Hymns, no. 110); “If You Could Hie to Kolob” (arranged by Plain, published by ITM Music; Hymns, no. 284); “Redeemer of Israel” (Hymns, no. 6); “Did You Think to Pray?” (arranged by Wilberg, unpublished; Hymns, no. 140); “Praise to the Lord, the Almighty” (arranged by Wilberg, unpublished; Hymns, no. 72). From the November 2001 Ensign — Music by the Mormon Tabernacle Choir, directed by Craig Jessop and Barlow Bradford, with organists Linda Margetts and Bonnie Goodliffe: “High on the Mountain Top” (Hymns, no. 5); “Nearer, My God, to Thee” (arranged by Bradford, published by Deseret Book; Hymns, no. 100); “Let Us All Press On” (Hymns, no. 243); “God Be with You Till We Meet Again” (arranged by Wilberg, unpublished; Hymns, no. 152).